Doug Ross @ Journal: SALON: Democrat-Run Education System Responsible for Our "Disgraceful State Of Politics"
SALON: Democrat-Run Education System Responsible for Our "Disgraceful State Of Politics"
The author, David Masciotra, proves that we do need a better education system, since that Ben Franklin quote is used out of context, and doesn’t mean what he thinks it means. The full quote, along with Franklin’s full writing, actually shows what happens with the type of politics and policies Dems push. In the current circus posing as a political campaign, commentators and candidates waste much of their time and energy frothing about insignificant issues and phony crises. Donald Trump, with all the eloquence and brilliance of a barroom belch, has introduced illegal immigration into the political debate, often claiming that it is one of the reasons that America is “going to hell.” Trump has failed to make a deal with reality, as it stubbornly refuses to submit to his paranoia. Illegal immigrants comprise a mere 3.5 percent of the American population, and from 2009 to 2014, more Mexicans left the United States than entered it. If trends continue, Trump’s “big, beautiful wall” will keep more Mexicans in the country than it keeps out. Meanwhile, the cowardly obsession surrounding “Islamic terrorism” continues to play out like a scene of absurdist theater. Tragedies and atrocities, like recent bombings in Brussels and Pakistan, demand sympathy for mourners and vigilance toward the perpetrators, but standard methods of statistical evaluation demonstrate that an American has a one in 4 million chance of dying in a terrorist attack. The average American is more likely to drown in the bathtub. An advanced degree in sociology is not mandatory for finding evidence confirming Rice’s bleak forecast of America’s ignorant future. Two-thirds of Americans cannot name a single Supreme Court justice, and half are incapable of identifying all three branches of government. Forty-two percent of the public does not believe in evolutionary biology, while 24 percent believe that the sun orbits the earth. Nearly a quarter of Americans read below the fifth-grade level, which helps to explain why only 29 percent read a newspaper, and why 24 percent of Americans do not read even one book a year. 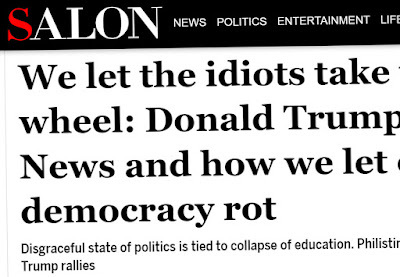 Of course, the article goes on to bash Trump and his supporters, but, fails to note who runs the education system. The problems can be laid almost entirely at the feet of the Democratic Party. They aren’t particularly worried about education, they are attempting to create good little Democrats, everywhere from standard liberals to frothing at the mouth Progressives, Socialists, and Marxists. They’re the ones pushing kids to get worthless degrees, typically ones that end in “studies”, which have little to no value as a marketable skill, and are even detrimental, as employers will look at the degrees, along with what the Snowflakes did in college, and decide that the person will bring more trouble then they are worth, and even be a threat for a lawsuit. If they cannot name a SCOTUS justice, if they do not know the three branches of government, if they are missing lots knowledge, whose fault is that? Do not look towards Republicans. We do not own the system. Read more at Pirate's Cove.